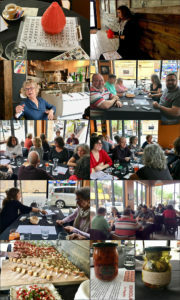 On May 21st, Sentieri Italiani and Bella ‘Mbriana teamed up once again for another evening of fun and games — specifically TOMBOLA, the Italian version of BINGO. Snacks and drinks were served to a couple dozen intense participants while a rotation of “tombolone” called out the numbers in Italian (and English). Prizes of gourmet food items were awarded to the first and second place winners of each round. Watch this website for future Italian-themed game nights and join in the fun! « La Cena Pugliese – A tasty time was had by all!